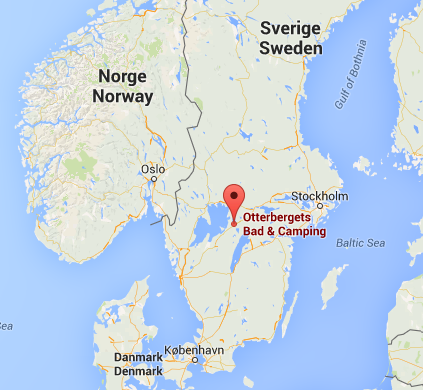 The camping has two fully equipped caravans with an awning, suitable for four. Both caravans have electricity and a (cassette) toilet. 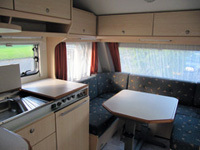 The caravans have a three flame gas burner, refrigerator with freezer, coffee machine, kitchen utensils, tableware and cutlery. There is an electric heater, wardrobe and single duvets and pillows are present. Of course both caravans have their own outdoor table and chairs. You will find a shower nearby in the facilities building. 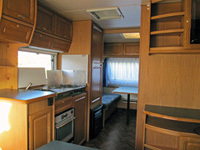 This large caravan has two seating areas, one of which can be easily used as a permanent double bed. The caravan is also equipped with an oven. 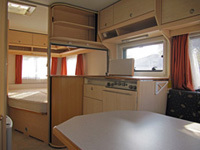 This caravan is equipped with a double bed and a large seating area. It has a built in safe.